YOUR CONTRIBUTION DIRECTLY SUPPORTS HABITAT FOR HUMANITY HOME BUILDING IN OUR COMMUNITY! "Seeking to put God’s love into action, Habitat for Humanity brings people together to build homes, communities and hope." Financial support for Habitat for Humanity of the Greater Wenatchee area comes from private donations, church donations, Habitat for Humanity Store sales, grants and other fundraising efforts. We couldn't do it without the generous support of our community partners! Please help us thank them with your support! Thank you Sav-Mart for donating a dishwasher to each home built since 2015! Thank you Sherwin-Williams for your donation of 22 gallons of interior and exterior paint for our 50th house! Grace Lutheran has generously donated office space for more than 20 years. Thank you! Thank you Luis Amante with Seal Plumbing for your generous contribution to our 50th house! Welcome to the HFH team! 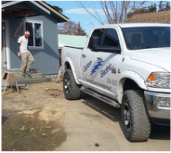 Thank you Jay and the Custom Electric for generously donating your time to wire our 50th house! We are thankful to have you join our team! The team at Apple City Electric has volunteered their time on several of our projects! Thank You!